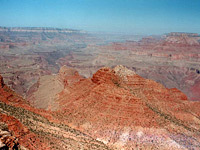 Sunday 26 June 1994: Next morning, another hot cloudless day, we went along the east rim drive - road 64, and stopped at Desert View to View Desert. This was the best place to see the canyon that we found; long vistas west and north along the Colorado, and east to the Painted Desert. There was a curio shop selling the usual cheap souveniers, an old stone-built watchtower (more money to go up) and the last gas station for a while. The road veered away from the Colorado, passing through forests at first, then across hilly scrubland, before descending towards US 89, and back to barren desert. The Little Colorado River Gorge is worth a visit; most of the land is completely flat, but the river cuts a twisted narrow canyon across the plain. A left turn at Cameron, and due north took us through the centre of the Painted Desert. Along with an area of southern Utah, around road 24 west of Hanksville, this part of Arizona looks most like another planet, with the multicolored earth sculpted in many strange forms and stretching for miles and miles. About the only signs of any civilisation were the regular Indian jewellery stalls, many abandoned, but some with bored-looking Indians waiting for a chance visitor. As we approached the Colorado river crossing at Marble Canyon, the distant cliffs on either side came closer and more scenic. The bridge across the Colorado was being rebuilt at the time, but it was still spectacular. On the other side of the river, the road doubled back, and continued with the incredible Vermilion Cliffs to the right. 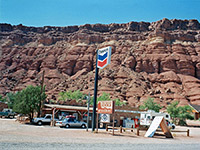 Cliff Dwellers is a useful stop to fill up with gas, and to marvel at its setting. The temperature here was 102 °F. Later, US 89 turns away from the cliffs and becomes perfectly straight for about 10 miles, before climbing abruptly towards the Kaibab Plateau. A viewpoint gives magnificent views eastwards towards the flat desert towards the Colorado; soon after this the surroundings change once again to forest as the elevation steadily increases. 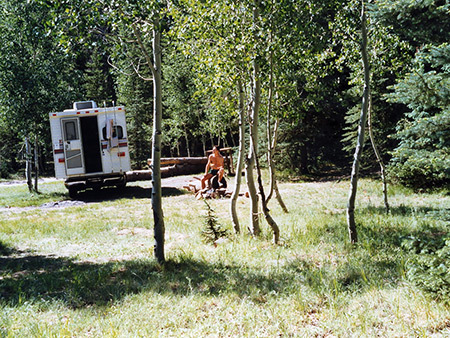 We turned left at Jacob Lake (no sign of either Jacob or a lake) passing through thick pine forests and across grassy meadows and reached the north rim of the Grand Canyon by early evening. This I found a little disappointing, the view was only of a side-canyon, and the weather was not ideal, being a bit cloudy. 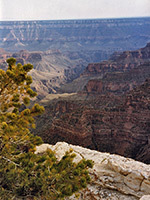 At least there were many fewer people than at the south rim - the guidebook says that only one in ten visit the north. Another road continued for 25 miles to the Cape Royale viewpoint but the journey took almost an hour due to the sharp bends and hills. A short walk led us from the carpark to the canyon edge, in the company of many people waiting hopefully for a sunset. In the distance, the watchtower of Desert View on the south rim was just visible, and beyond the San Francisco mountains north of Flagstaff could be seen. This would have been the perfect place to watch the sun go down alone, with majestic views in both directions, but there was no sun, lots of people, we were tired and were not allowed to park our RV overnight within the National Park. After a speedy (as possible) trip back up the entrance road we found a logging track leading into the forests where we could stay the night, in the company of some other campers and quite a few deer.